We should be cautious, too, about extrapolating too much from past election cycles about the result in 2015 – as has become a popular pastime. Yes it is true that no government has ever increased its share of the vote after a first full parliamentary term since the war. Yes it is true that Labour’s poll share and Ed Miliband’s ratings are below what might be expected of a strong opposition. But precedents are there to be broken, and the 2010-2015 election cycle is arguably like no other in living memory. The main political parties are receiving an increasingly low share of the vote, and electoral geography has become so substantially distorted, that comparisons with leads from past elections are potentially misleading. The public are generally sick and tired of politics and politicians, so the ratings for leaders such as Miliband must be put in the context of a general disillusionment of citizens with the political class. And while the state of the economy matters to the election result, and there are signs of slight improvement (not to mention the warnings of a housing bubble due to the government’s policies) – other features of today’s economy are hardly likely to see voters rushing to reward the government, with the continued strain on living standards, a shift from full-time secure employment to part-time unsecure jobs, and the growth of private debt to fuel the increase in consumer spending. When we reported on UKIP at the time of its annual conference in Birmingham in September 2012, the party had just emerged on the scene as a serious political force – first following growing public attention to the EU and Eurozone bailouts and second in the aftermath of desertion of Conservative voters after the Omnishambles budget of March 2012. Since then, UKIP have shown they are more than just a flash in the pan, adding a further four points to their support, which now stands at 11.3%, well above the traditional third party, the Liberal Democrats. 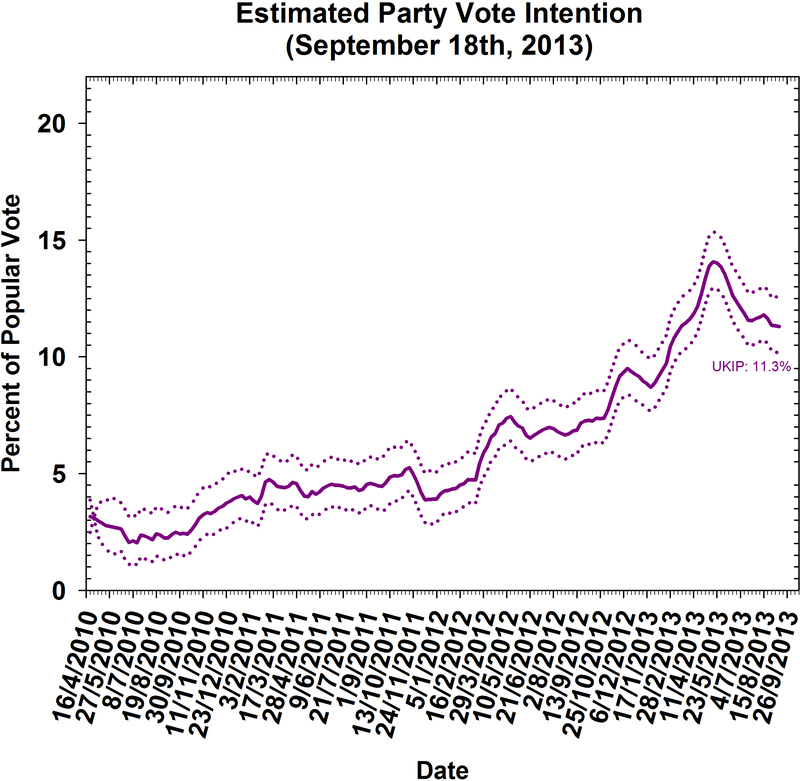 This represents something of a fall on their May peak of more than 14% in the Polling Observatory estimates, but it nevertheless looks like UKIP will be a significant factor in the 2015 election. Most significantly, research commissioned by Lord Ashcroft shows it is having an impact on support for the party in marginal constituencies that will likely decide the result, and may deliver the election (and a parliamentary majority) on a plate to Labour and Ed Miliband. UKIP, and its talismanic leader Nigel Farage, have already started to face the message that ‘a vote for UKIP is a vote for Labour’ – as Conservatives and sympathetic media commentators have started to realise the threat posed by Farage and his party. There has also been a surge of interest in the background of Farage and the records of UKIP candidates, as attempts to undermine the credibility of the party have been stepped up as Conservative fears have grown – with the PM’s former PR adviser, Andy Coulson, advocating highlighting the “less pleasant and stranger utterances” from Mr Farage. Both strategies have the potential to backfire: Conservative attempts to get UKIP supporters to vote strategically risks underestimating its supporters’ hostility to the political system in general, and to David Cameron in particular, while efforts to paint the party as extreme or incompetent risk looking like a smear campaign, which could increase UKIP’s populist appeal. But UKIP have already changed the political landscape for 2015, and may yet cost the Conservatives votes, even if not directly at the ballot box – but in driving the party off the centre ground that David Cameron had managed to inhabit in the run up to the 2010 election. UKIP are putting serious and sustained pressure on the Conservatives to tack to the right to take up traditional Tory territory – much to the (secret) delight of commentators in the right-wing press who have enthusiastically been drumbeating over the need to move more towards the political agenda set by UKIP (see here, here and here). Boris Johnson has described UKIP supporters as the ‘lost tribe’ of Conservatives, but there is still much confusion in Conservative ranks over how to handle the UKIP challenge – simply because they are dragging the party back towards its ideological roots, away from most voters. It therefore has revived the fundamental tension in the post-Thatcher Conservative Party – with the main hope for the party being that the British public has shifted rightwards in the past decade. Ultimately what UKIP supporters are unified by is dissatisfaction with politics and the ruling class, revealing a much deeper underlying discontentment with democracy in Britain than will be solved with parties trying to position themselves further to the right.